If you are looking for a high quality stapler for your desk or for your office you have come to the right place. We carry the full line of Novus, Acco, Bates and Swingline staplers. We have it all. Choose from electric, heavy duty high capacity, traditional desktop, hand grip and specialty models. Plus, we carry the full line of staples for use with virtually any office stapler that you may own. Or if you are looking for larger more substantial unit consider checking out our paper-handling equipment section for stitchers and booklet making equipment. Welcome to MyBinding video. If you’re looking for a high-quality stapler for your desk or your office, you’ve come to the right place. We didn’t even know there were so many kinds, and we sell them all. Brands such as Novus, Acco, Bates, Swingline, we have it. Whether you need an electric stapler, a heavy-duty, high-capacity stapler, a desktop stapler, a hand stapler or a specialty stapler, it’s here. You can click around, find it yourself, give us a call, we can help you find it. And we try to have a video for every product we sell so you can see it in action before you buy it. We even carry a full line of staples for use with virtually any office stapler that you may own. 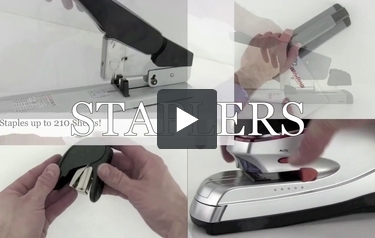 And between you and me, the guy who makes these videos, not all staplers are created equal. We want to help you choose wisely, even if it is a stapler. When image matters, MyBinding.